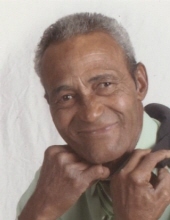 Mr. Larry "Henney" Hunt, of Rowland was born on March 20, 1948 to the late Sanford Hunt and Mabel Hunt and departed this life on January 13, 2019 at his home completing her journey of 70 years. Along with his parents, he was also preceded in death by his sister: Geraldine Hunt. Mr. Henney leaves to cherish his memories, his wife of 23 years: Margaret Chavis of the home; a son: James Chavis and wife Nina of Beulaville and their children: James and Chris; a daughter: Linda Chavis of the home and her children: Jessica, Cody, and Corey; one great-grandchild: Kensley; a special nephew: Johnny Brown of Rowland; a nephew and niece: Mario and Makkitia Brown; someone special to his heart: Alana Boney; and a host of relatives and friends. Services entrusted to Boles Funeral Home in Rowland. To send flowers or a remembrance gift to the family of Larry "Henney" Hunt, please visit our Tribute Store. "Email Address" would like to share the life celebration of Larry "Henney" Hunt. Click on the "link" to go to share a favorite memory or leave a condolence message for the family.